Okotoks has become a popular neighbouring community Okotoks homes for sale with Okotoks Alberta real estate plus condos in sought after Okotoks communities. With Okotoks new homes plus just listed homes for sale you're sure to find a easy place to call home. 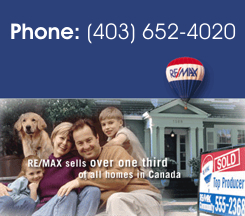 Looking to settle down in Okotoks but wondering where to start? Even if you think you know sometimes it can be hard to find the perfect home. And whether you're looking for a quiet place to settle down, or you want to be close to downtown we've got the Okotoks listings. It's hard to beat Okotoks for small-town friendliness and community pride. The youth are so committed to the beautiful Rocky Mountain environment that their local high school, Foothills Composite, has been designated one of Canada's "green" schools. Since that article, however, Okotoks has grown to be virtually a self contained small city. With large shopping facilities archored for retailers such as Home Depot, Canadian Tire, numerous office developments and various new subdivisions, Okotoks real estate is almost par with Calgary for suburban homes. High end communities such as the lake community of Crystal Ridge, Air Range and others also offer very high quality homes in the $850,000 + range. Prices for acreages in the outlying areas of Okotoks range from $600,000 for smaller acreages up to $1.5M+ for estate acreages in areas like Willowside and Rusty Spurs. Norris Coulee a 320 acre estate acreage development to the east of Okotoks along Highway 552 is the Springbank of the south with virtually all acreages over $1.3M up to $3M. This community also has its own new school. Generally prices of smaller acreages to the north of Okotoks are somewhat higher than those south of Okotoks, but lately with the expansion of Okotoks and its many amenities, and the Deerfoot Extension, properties to the south are catching up in value.